Rub beef and chicken with fajita seasoning and 2 teaspoons garlic powder. Cut beef and chicken into 1-inch strips, and set aside. In a saucepan, warm refried beans over medium-low heat. Stir salt, lemon pepper, and 1/2 teaspoon garlic powder into mashed avocados. Set aside. Heat corn oil in a deep skillet over medium-high heat. Cut tortillas in half, then cut in half again to make 4 triangular pieces per tortilla. Place into the skillet as many tortilla pieces as will fit without overlapping, and fry until crisp; repeat this process until all the tortilla pieces have been fried. Remove crisp tortillas to paper towels. Discard oil, and wipe out skillet. Return skillet to medium heat, and stir in beef, chicken, bell pepper, and onion. Cook, stirring occasionally, about 7 minutes; then stir in cilantro. Layer the tortilla pieces along the bottom of a large baking dish. Spread refried beans evenly over tortilla pieces. Sprinkle cheese over beans, then spread meat mixture evenly on top. Bake in preheated oven until cheese and beans are bubbly, about 20 minutes. 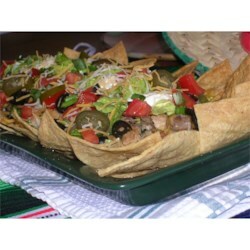 Remove from oven, and drop sour cream and guacamole by tablespoonfuls in various places across the top. Sprinkle tomatoes and jalapenos on top.